Somalia has a rich musical heritage centered on traditional Somali folklore. Somali songs are pentatonic. That is, they only use five pitches per octave in contrast to a heptatonic (seven note) scale such as the major scale. At first listen, Somali music might be mistaken for the sounds of nearby regions such as Ethiopia, Sudan or the Arabian peninsula, but it is ultimately recognizable by its own unique tunes and styles. Somali songs are usually the product of collaboration between lyricists (lahamiste), songwriters (abwaan), and vocalists (odka or "voice"). 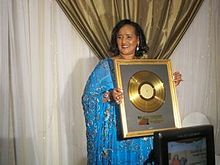 Somali singer Saado Ali Warsame receiving a Gold Record, Lifetime Achievement Award. The first major form of modern Somali music began in the mid-1930s, when Somaliland was a part of the British Somaliland protectorate. This style of music was known as dhaanto, an innovative, urban form of Somali folk dance and song. This period also saw the rise of the Haji Bal Bal Dance Troupe, which became very influential over the course of its long career. Abdullahi Qarshe, popularly known as the father of Somali music. Somali popular music began with the balwo style, pioneered by Abdi Sinimo, who rose to fame in the early 1940s. This new genre then in turn created the Heelo style of Somali music. Many qaraami songs from this era are still extremely popular today. This musical style is mostly played on the kaban (oud). Prominent Somali kaban players of the 1950s include Ali Feiruz and Mohamed Nahari. During the Siad Barre regime, music was suppressed except for a small amount of officially sanctioned music. There were many protest songs produced during this period. Bands such as Waaberi and Horseed have gained a small following outside of the country. Others, like Ahmed Ali Egal, Maryam Mursal and Waayaha Cusub have fused traditional Somali music with pop, rock and roll, bossa nova, jazz, and other modern influences. Music recorded in the 1970s was preserved in Hargeisa, buried underground, and is now available at the Red Sea Foundation at the Hargeisa Cultural Center, and in Radio Hargeisa. The Barre regime effectively nationalised the music scene, with bands and production under state control. Bands were operated by the police, the army and the national penitentiary. Female singers were encouraged more than was the case in most of East Africa. Most musicians had left the country before 1991. Hiddo Dhawr is now operating as the only live music venue in the city. Ostinato Records, a U.S.-based label dedicated to African music, has digitized much of the recovered collections housed at the Red Sea Foundation. In 2017 Ostinato along with Nicolas Sheikholeslami, a Berlin-based music researcher and collector, released Sweet as Broken Dates: Lost Somali Tapes from the Horn of Africa. The compilation album features material from the preserved recordings, as well as new recordings from the Somali diaspora. The album was nominated for a Grammy Award in the Historical category . Artists such as Abdi Holland have popularised Somali nationalism in Somali music. The first radio station in Somalia to air popular Somali music was Radio Kudu based in Hargeisa, Somaliland. It started broadcasting in 1943 in English, Somali and Arabic, before being renamed the following year to Radio Somali. Somali music is now regularly broadcast on the state-run Radio Mogadishu, as well as a number of private radio and television networks such as Horn Cable Television. Popular Somali singer Aar Maanta. ^ African Language Review, Volume 6. The University of Michigan: F. Cass. 1967. p. 5. ^ Johnson, John William (1996). Heelloy: Modern Poetry and Songs of the Somali. Indiana University Press. ISBN 1874209812. ^ "Uncovering Somalia's forgotten music of the 1970s". Al Jazeera. 18 August 2017. Retrieved 22 August 2017. ^ "Somali songs reveal why musical crate digging is a form of cultural archaeology". The Conversation. 29 July 2018. Retrieved 1 August 2018. ^ "The Lost Songs From Somalia's Golden Age of Music Are Compiled In This New Mix". Okay Africa. 20 March 2017. Retrieved 1 August 2018. ^ "These lost and found Somali tapes are now nominated for a Grammy award". Quartz Africa. 30 November 2017. Retrieved 1 August 2018. ^ Journal of the Anglo-Somali Society, Issues 30-33. Anglo-Somali Society. 2001. p. 56. Retrieved 28 June 2014. Abdullahi, Mohamed Diriye (2001). Culture and customs of Somalia. Greenwood. ISBN 978-0-313-31333-2.